"The missile took off vertically, turning horizontally into desired direction, booster separated, wing deployed, engine started and cruised all the intended waypoints. The missile demonstrated its sea skimming capability to cruise at very low altitudes," the ministry said. 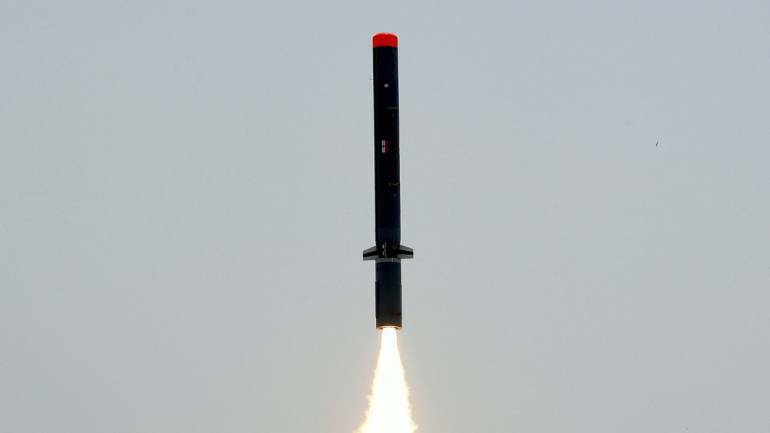 Describing the trial "successful", DRDO sources said the missile, which is capable of loitering and cruising at 0.7 Mach at an altitude as low as 100 metres, covered the designated target range in 42 minutes and 23 seconds. The flight test achieved all the mission objectives, right from lift off till the final splash, boosting the confidence of all scientists associated with the trial, they said, adding it has an engine with rocket booster and turbofan/jet. The sophisticated missile took off in a programmed manner and all critical operations like launch phase, booster deployment, engine start, wing deployment and other parameters were demonstrated through autonomous waypoint navigation. "The missile majestically cruised and covered its given range," the sources said, adding it was tracked with the help of ground-based radars and other parameters were monitored by indigenous telemetry stations developed by DRDO. The last successful trial of Nirbhay cruise missile was conducted on November 7, 2017.